When calendar watches were first introduced into Hamilton's model line in 1954 they were included in other model lines and just called "Calendar". They were few and far between. Eventually there were calendar models in the K-series, the Thin-o-matic series and the Accumatic series. 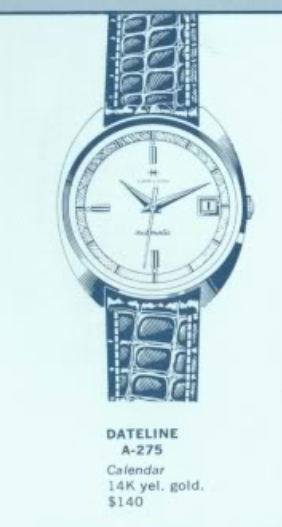 In 1963 Hamilton consolidated models with date complications into the Dateline series. There are A-models like the Accumatic line and T-models and TM-models like the Thin-o-matic line. One of the early Dateline A-models was the 1964 A-475. It's interesting that it was introduced in 1964 since there's also a Dateline A-476, but it came out in 1963. Maybe the A-475 wasn't ready yet? It was produced for only two years. The Dateline A-475 came in a single piece 10K gold filled case with a very simple dial and a separate chapter ring that goes around the outside perimeter of the dial. It looks very similar to other models like the Dateline A-275 - except the A-275 is solid 14K gold. It also looks like a 1963 Dateline A-576, but that's in stainless steel. The A-series models use ETA-based automatics and in the Dateline A-475 you will find a 17 jewel 694 movement. I don't think you see the Dateline A-475 very often. That's probably because there were a lot of other options in the 1964 line-up and it was only made for a short while. My project watch has seen a lot of use over it's 53 years of existence. The Speidel bracelet is not original to the watch but it's obvious been on there a long time. Either it, or another bracelet, has worn a groove into the lugs of the case. It's for this reason that I personally prefer straps. Leather straps don't tear up lugs like a metal bracelet will. The back of the case shows considerable wear through and the gold layer is missing in a large section. That must have been one hairy arm! Models with reflector rings can be a challenge to open. The best way is to separate the two-piece stem and remove the crown, then blow air into the case to pop the crystal off. My air pump has failed to work. It doesn't seem to pressurize the case. I suspect the crystal is leaking the air. The wear is limited to the outside of the case. The inside looks fine and I don't even see any watchmakers marks. I wonder if this watch has ever been serviced? The hole at the top is to center the reflector ring so the indices line up correctly. The 694 movement is in great shape with no rust. That's always good to see. You never know what you'll fine when you open a "waterproof" case. There are a couple of minor scratches on the dial so at some point this case has been opened. I don't think the dial or hands have ever been relumed though. Everything gets taken apart and throughly cleaned. The movement was fairly shiny to begin with but it really sparkles now. The partially assembled movement is ticking away with good motion. It's off to the timer to see how well its working. Well, it's running a little fast and the beat error is sky-high. I'll run it past the demagnetizer and re-clean the hairspring... maybe I got a little oil on it. A little more cleaning and then some tweaking of the hairspring stud reduced the beat error to zero. Now to reduce the beat rate by slightly moving the regulator index. There... pretty much right on the money now. I'm not concerned about the amplitude as I didn't wind the watch very much since there's no crown attached to the stem. Once the rest of the movement is reassembled it can go back into the case. The reflector ring drops in on top of the dial and the little post goes into the hole at 12:00 to align it correctly. Before I can put the hands on I will need to advance the time until I see the date change. Then I know it's midnight. The crystal that was on the watch appears to "fit" but the profile of the side is very straight. Typically there's a slight ledge that the crystal needs to anchor into in order to get a good seal. I'll install a new crystal with a 30.8mm diameter and see if that's a better solution. Notice the profile of a PHD crystal is angled to wedge into the ledge. The case polished up nicely and a fresh alligator strap looks much better than that rickety old Speidel bracelet. There's not much I can do about the wear on the case back but at least you can't see it from the front. This is a very clean and sharp-looking design. The Dateline A-475 didn't stick around very long, but there are a lot of other models with very similar designs that came after it. Perhaps this was their inspiration.